Former British Army soldier Glenn Bradley, who is a member of Veterans For Peace, and participates in a number of reconciliation initiatives, recalls reading Fidel Castro whilst on duty in Germany. Fidel Castro and Ernesto Che Guevara are constants in my life. Che, murdered in tragic circumstances, became the icon, the poster boy for socialist revolution, and his iconic image adorns my living room wall to this day. 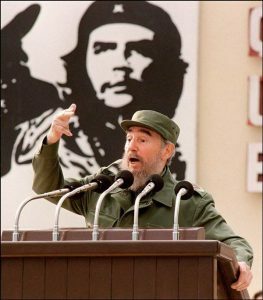 Fidel, the change management pragmatist, became the old man of socialist revolution whose appearance to me came largely via the televised media until I decided to learn for myself. Dates are becoming blurred to me but I think it was around May 1989 I found myself on notice for deployment to what was then termed ‘Münster Nord Site Guard’. At the time I was an NCO in the 1st Battalion, the Royal Irish Rangers (1 R IRISH). The Battalion had just completed a first historic operational tour in County Fermanagh as part of the British government policy to ‘internalise’ the conflict in Northern Ireland by pitting Irish people against Irish, but had returned to BAOR as part of the then Cold War postings of that era. The FRB (Fermanagh Roulement Battalion) tour I’d just been on and the Operations in which I had participated during it had left a questioning impression on me about the “how & why” causes of conflict, and so I’d chosen to widen my mindset. The site at Münster Nord was/is secret, but safe to state it was recognised that the US enjoyed sovereignty in this part of Germany and the site housed nuclear missiles. As a NATO structure the Americans controlled the Nukes, we Brits guarded/protected the site and the (then West) Germans monitored the wider soft structure perimeters through policing operations. The duties are laboriously boring and when not actually in an observation tower, patrolling or on radio stag, you’ve to kill time reading, watching TV, or whatever. However, when deployed to site, one was on site for the period, a little ‘nuclear cage’, as we’d have said at time. I used the opportunity to learn and had brought with me History Will Absolve Me and Socialism & Man in Cuba by Fidel Castro. I became engrossed, and became through Castro’s words inspired, yet even then the irony of my situation was not lost on me: a working-class, West Belfast lad, institutionalised by the British Army, respecting and being influenced by revolutionary socialism (Caribbean style), while sitting on top of a US Nuclear Silo! The books were a catalyst for positive mindset change in my life, and given the passing of that ‘old man’, but inspirational leader Fidel Castro, I just wish to record my thanks to him and to Ernesto.